In the early 1800’s an eleven year old Hungarian boy named Ignaz Von Peczely caught an owl and accidentally broke its leg. The boy looked into the bird’s eye and noticed a black stripe in the iris. Years later Peczely came up with the idea that illnesses or a propensity towards them could be diagnosed by looking at markings on the iris. This idea, iridology, is based on the unfounded belief that each area of the body is represented by a corresponding area in the iris of the eye. Some also claim that the eye markings can reveal a complete history of past illnesses as well as previous treatment. This is of course, complete nonsense unsubstantiated by any science. Owl’s eyes are certainly fascinating, though. 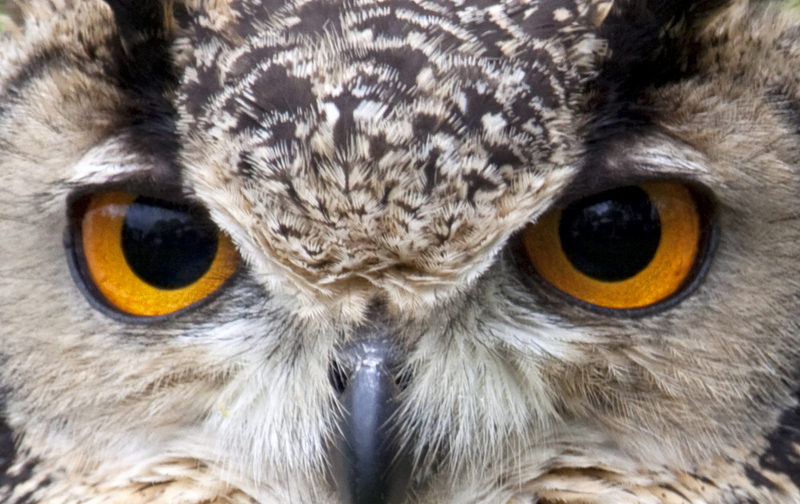 In a Great Horned Owl, the eyes are as large as human eyes and take up a lot of room in the much smaller skull. The size of the ears and the eyes in an owl’s head perhaps explains why an owl’s eyes are in the front of its face rather than on the side like most birds – there is no room on the side because of the ears. In fact, if you look through an owl’s ear, you can see the back of the eye! Owls have many more rods (black and white sensitive cells) in their eyes than do humans or other diurnal creatures and so can see extremely well in the dark. But they have fewer color sensitive cells (rods) so they see things mostly in monochrome. Myth has it that owls are blind in the daytime. Not true; they see just fine. The purpose of the iris is to act as a lens to expand and shrink to allow the proper amount of light in through the pupil. So in a bright light, the owl’s iris will expand to shrink the pupil and minimize the amount of light transmitted to the retina. Most people encounter an owl in the daylight, so the bird’s iris appears large and impressive, no doubt contributing to Ignaz Von Peczely’s fascination with the owl’s eyes. But repeated testing of experienced practitioners has definitively demonstrated that iridology has no basis in reality in owls’ or anybody’s eyes.